The first objective of this study was to evaluate the use of lyophilised biomass of the cyanobacterium Arthrospira platensis F&M-C256 as the sole substrate for lactic acid fermentation by the probiotic bacterium Lactobacillus plantarum ATCC 8014. After 48 h of fermentation, the bacterial concentration was 10.6 log CFU mL−1 and lactic acid concentration reached 3.7 g L−1. Lyophilised A. platensis F&M-C256 biomass was shown to be a suitable substrate for L. plantarum ATCC 8014 growth. The second objective of the study was to investigate whether lactic acid fermentation could enhance in vitro digestibility and antioxidant activity of A. platensis biomass. Digestibility increased by 4.4%, however it was not statistically significant, while the antioxidant activity and total phenolic content did increase significantly after fermentation, by 79% and 320% respectively. This study highlights the potential of A. platensis F&M-C256 biomass as a substrate for the production of probiotic-based products. Lactic acid-fermented products from milk (yogurt and cheese) are widely consumed, but the demand for dairy-free alternatives is rapidly rising because of the increasing incidence of lactose intolerance and veganism, and as a response to the request for higher nutritional quality and fortified food products (Kandylis et al. 2016; Panghal et al. 2018). In this respect, lactic acid fermentation is considered a valuable technology to enhance shelf life, safety, sensory and nutritional properties of vegetables and fruits (Di Cagno et al. 2013). Some algae represent a suitable substrate for the production of fermented foods due to their availability and high nutritional value (Gupta and Abu-Ghannam 2011; Gupta et al. 2011; Uchida and Miyoshi 2013). Many and diverse fermented products (powders, beverages, delicacies) from seaweeds, microalgae (mainly Chlorella and Dunaliella) and spirulina (different Arthrospira species), usually mixed with plant-derived substrates and obtained through different fermentative processes (by lactic acid bacteria or yeasts or a mixture of these microorganisms), are available in the market and easily found on e-commerce platforms. In comparison to the numerous studies on algae fermentation (Gupta et al. 2011; Nguyen et al. 2012; Talukder et al. 2012; Uchida and Miyoshi 2013), those on cyanobacteria are limited and focus particularly on Arthrospira spp. Bhowmik et al. (2009) added spirulina biomass to cultures of different Lactobacillus and Streptococcus strains and performed 10h fermentations, observing an increase in the bacterial number with increasing biomass concentrations. Parada et al. (1998) added the filtrate from A. platensis cultures to various lactic acid bacteria cultures, which were allowed to ferment for 24 h. The filtrates increased growth of all the bacterial strains. De Caire et al. (2000) added spirulina biomass at different concentrations to milk and then fermented the suspension with a blend of lactic acid bacteria. The presence of spirulina biomass favoured the growth of the bacteria. Several authors (Varga et al. 2002; Guldas and Irkin 2010; Beheshtipour et al. 2012, 2013; Mazinani et al. 2016) have tested the effect of spirulina biomass addition to yogurt, cheese, and fermented milk, with positive results, among which included an increase in the number of lactic acid bacteria and improvement of the nutritional quality of the fermented product during storage. However, to the best of our knowledge, the suitability of spirulina biomass as the sole substrate to obtain lactic acid-fermented products has not been investigated. Arthrospira, besides accumulating, like all cyanobacteria, glycogen as primary energy and carbon reserve, contains high levels of proteins (up to 70% dry mass) of high value due to the presence of all the essential amino acids (Becker 2007). Arthrospira also contains high levels of vitamins, minerals (particularly iron), essential fatty acids (particularly γ-linolenic acid), carotenoids and chlorophyll (Ghaeni et al. 2014), and a number of unexplored bioactive compounds (Kulshreshtha et al. 2008; Tredici et al. 2009; Chacón-Lee and González-Mariño 2010; Soheili and Khosravi-Darani 2011). Arthrospira has potent antioxidant activity due to the presence of polyphenols and phycocyanin (Liu et al. 2011) and also shows interesting lipid-lowering effects (Colla et al. 2008; Bigagli et al. 2017). Arthrospira nutritional properties could be improved through lactic acid fermentation, which could increase digestibility of the biomass and availability of nutritious substances, besides providing probiotic bacteria. Probiotic microorganisms are “live microbial food supplements which beneficially affect the host animal by improving its microbial balance” (Fuller 1992). Lactobacillus plantarum has been proposed as probiotic, and several studies have been performed that show its capacity to resist transit through the gastric tract, ability to colonise the host gut, safety and potential health benefits such as cholesterol reduction (de Vries et al. 2006; Georgieva et al. 2009; Karczewski et al. 2010). A prebiotic is defined as “a substrate that is selectively utilized by host microorganisms conferring a health benefit” (Gibson et al. 2017). Polysaccharides from algae, for example β-glucans from C. vulgaris, and spirulina biomass are already recognised and accepted as dietary prebiotics (Jiménez-Escrig et al. 2013; de Jesus Raposo et al. 2016). This study was designed to investigate the suitability of A. platensis F&M-C256 biomass as the sole substrate for L. plantarum ATCC 8014 growth and fermentation and to evaluate the fermented product in terms of probiotic bacteria content, in vitro digestibility and antioxidant capacity, which are parameters of great importance for the development of functional foods. Biomass of Arthropira platensis F&M-C256 was produced at Archimede Ricerche S.r.l. (Imperia, Italy). The cyanobacterium was cultivated in Zarrouk medium (Zarrouk 1966) in GWP®-I photobioreactors (Chini Zittelli et al. 2013) in semi-batch mode and harvested by filtration. The biomass was washed with tap water to remove excess bicarbonate, then frozen, lyophilised, powdered and stored at − 20 °C until use. In the literature, Arthrospira platensis is often incorrectly reported as Spirulina platensis (Tomaselli et al. 1996). To avoid confusion with the true Spirulina genus, in the present work, we have always adopted the correct denomination A. platensis. Lactobacillus plantarum ATCC 8014 (LAB 8014) was purchased from Cruinn Diagnostics Ltd. (Dublin, Ireland). The culture was maintained at − 80 °C in a Thermo Scientific Revco Elite PLUS Freezer ULT2586-10-A (USA) in 20% glycerol stocks. For the preparation of the inoculum, 25 mL of autoclaved MRS broth (Scharlau Chemie, Spain) was inoculated with 1 mL of thawed LAB 8014 stock culture and incubated at 37 °C for 24 h in an orbital shaker (Gallenkamp, Weiss Technik, UK). This inoculum was then diluted (1:100) to obtain a working culture containing 6–7 log CFU mL−1 as determined by plate counts. The suitability of lyophilised A. platensis F&M-C256 biomass as substrate for LAB 8014 growth and fermentation was tested according to Gupta et al. (2011). Under sterile conditions, 5 g of lyophilised (8% water content) A. platensis F&M-C256 biomass was introduced in a 100mL Erlenmeyer flask, 40 mL of sterile deionised water was added and the suspension was inoculated with 2 mL of a LAB 8014 culture. Deionised water was then added to reach a final volume of 50 mL. The initial A. platensis biomass concentration in the inoculated suspension was thus 92 g dry weight L−1. Three replicates were prepared. The flasks were incubated at 37 °C and 100 rpm in an orbital shaker (Innova 42, Mason Technology, Ireland). Samples were taken at 0, 24, 48, and 72 h for microbiological and chemical analyses. A period of 72 h was considered sufficient to observe and evaluate the main fermentation parameters (Gupta et al. 2011). The pH was measured at 0 and 72 h. To evaluate in vitro digestibility, antioxidant capacity and total phenolic content, aliquots (15 mL) were taken at time 0 and after 72 h of incubation and lyophilised before analysis. Phenolics were evaluated also after 24 and 48 h of incubation. To exclude that the indigenous microbiota of A. platensis F&M-C256 biomass may have significantly contributed to the bacterial number increase during fermentation, 5 g of lyophilised A. platensis F&M-C256 biomass was introduced in 100mL Erlenmeyer flasks with 50 mL of deionised water without LAB 8014 inoculation, the flasks were incubated as for the inoculated tests and samples were taken at 0, 24, 48 and 72 h for bacterial growth determination by plate count. Viable LAB 8014 cell counts in the A. platensis broth (log CFU mL−1) were performed at the start and after 24, 48 and 72 h by plating on MRS agar (Scharlau Chemie, Spain). The fermentation broth was serially diluted (1:10) in Maximal Recovery Diluent (Sigma–Aldrich, Ireland) before plating. The plates were incubated at 37 °C for 36–48 h. The average weight of a L. plantarum cell was determined by growing LAB 8014 cultures (1 mL of thawed stock culture) in 100 mL of MRS broth incubated at 37 °C for 48 h. The cell number was determined by total counts with an Improved Neubauer counting chamber for bacteria, and the biomass dry weight was determined following the method reported by Guccione et al. (2014) using membranes with 0.22 μm porosity (Millipore, USA). The average weight of LAB 8014 cells was then calculated by dividing the biomass dry weight by the cell number. Samples were collected from the fermented broths at the start and after 24, 48 and 72 h, diluted 1:10 with water and centrifuged at 16,211×g for 15 min at 4 °C. The cell-free supernatant was used to quantify the lactic acid content. Analyses were carried out with a high-performance liquid chromatography (HPLC) system (Waters Alliance, e2695 Separation module, Waters Corporation, USA) equipped with an auto sampler and dual pump controller. The detection system consisted of a Waters-2996 UV detector (210 nm) and a differential refractometer (Waters-410) connected in series. The column (Rezex ROA-Organic acid 5 H+ (8%) 350.0 mm × 7.8 mm; Phenomenex, UK) was maintained at a temperature of 65 °C and was preceded by a guard column (50.0 mm × 7.8 mm; Phenomenex). An isocratic programme was used with a flow rate of 0.9 mL min−1 with a mobile phase of ammonium phosphate monobasic (0.05 M) (Sigma–Aldrich) adjusted to pH 2.4 with concentrated phosphoric acid (Sigma–Aldrich). An injection volume of 20 μL was used. Each sample was injected twice. Samples and mobile phases were pre-filtered using 0.22 μm filters (Millipore). Data acquisition and integration were performed using Empower 4.0 software (Waters Corporation). Sodium lactate standards (Sigma-Aldrich) were used to identify and quantify lactic acid in the samples. The in vitro digestibility was evaluated by the method of Boisen and Fernández (1997), modified by Niccolai et al. as reported in Batista et al. (2017), on lyophilised fermentation broth at time 0 and after 72 h of fermentation. The method reproduces the chemical-enzymatic digestion (by gastric and pancreatic juices) that occurs in the proximal tract of the monogastric digestive system. After 72 h of fermentation, broth samples were collected, frozen, lyophilised and powdered (particle size ≤ 1 mm) before analysis. One-gram samples were weighed and transferred to 250mL conical flasks. The analysis comprised two steps of enzymatic digestion: the first performed with porcine pepsin (Applichem, Germany) and the second with porcine pancreatin (Applichem) (Batista et al. 2017). To evaluate the radical scavenging capacity of the fermentation broth at time 0 and 72 h, the 2,2-diphenyl-1-picrylhydrazyl (DPPH) radical scavenging assay was carried out according to Rajauria et al. (2013). Briefly, the assay was performed in 96-well microtiter plates (Greiner Bio-One International GmbH, Germany) with 100 μL of DPPH radical solution (165 μM, in methanol, Sigma-Aldrich) and 100 μL of sample (0.2 g of lyophilised broth extracted for 30 min in 5 mL of a 1:5 methanol/water solution). The reaction mixtures were incubated in darkness at 30 °C for 30 min. The absorbances were measured at 517 nm using a UV-Vis spectrophotometric plate reader (BioTek USA). The total phenolic content assay was carried out according to Ganesan et al. (2008) using the Folin Ciocalteu assay. Samples of 0.1 g of lyophilised fermentation broth at time 0 and 72 h were dissolved in 10 mL of deionised water. To 100 μL aliquots of each sample, 2 mL of 2% sodium carbonate (Sigma-Aldrich) in water was added. After 2 min, 100 μL of 50% Folin Ciocalteu reagent (Sigma-Aldrich) was added. The reaction mixture was incubated in darkness at 25 °C for 30 min. The absorbance of each sample was measured at 720 nm using a UV-Vis spectrophotometric microplate reader. Results were expressed in gallic acid equivalents (mg GAE g−1) through a calibration curve of gallic acid (0 to 500 μg mL−1) (Sigma-Aldrich). All analyses were conducted in triplicate on three fermentation broths. The results were expressed as mean ± SD (standard deviation). All statistical analyses were carried out using Statgraphics Centurion XV (StatPoint Technologies Inc., USA). Statistical differences between different broths were determined using ANOVA followed by multiple range tests to determine the least significant difference (LSD). Differences were considered statistically significant when P < 0.05. Lactobacillus plantarum ATCC 8014 was cultivated for 72 h in a broth containing lyophilised biomass of A. platensis F&M-C256 (92 g dry weight L−1) as the sole component. The growth curve of LAB 8014, expressed as log CFU per mL of fermentation broth, is shown in Fig. 1. Immediately after inoculation (time zero), an average bacterial concentration of 5.3 ± 0.05 log CFU mL−1 was measured. The maximal bacterial concentration (10.6 ± 0.2 log CFU mL−1) was reached after 48 h of fermentation (Fig. 1). This corresponds to 11.6 ± 0.2 log CFU per gram of Arthrospira dry biomass initially added. 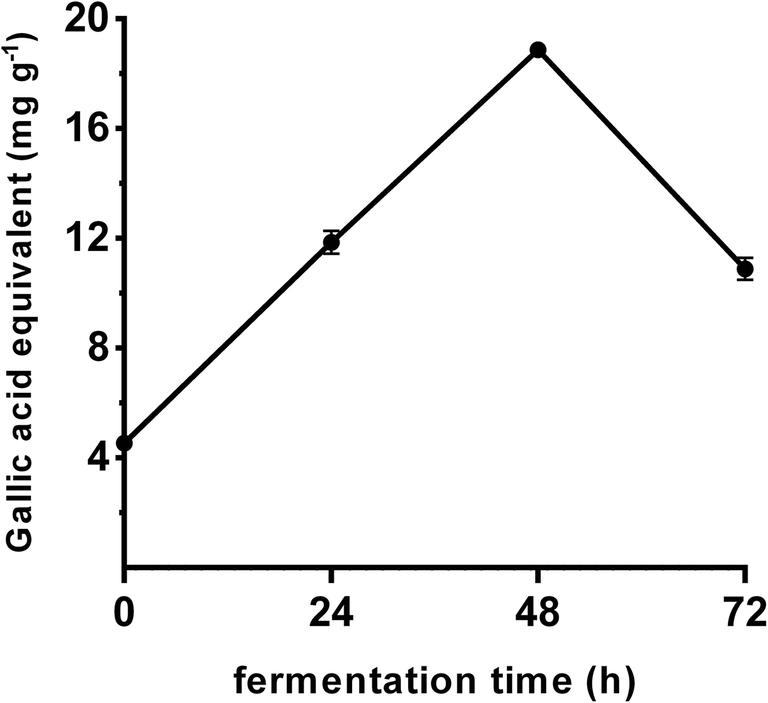 Considering the average weight of a LAB 8014 cell determined in this study (0.48 ± 0.07 pg), we can assume that after 48 h of fermentation, a concentration of 19.7 ± 7.6 g of bacterial biomass per litre of broth was reached. Thus, the yield of probiotic bacterial biomass from A. platensis F&M-C256 biomass was higher than 20% (21 ± 8.3%). These data indicate that A. platensis F&M-C256 is a suitable substrate for L. plantarum growth. Several authors (Gardner et al. 2001; Bergqvist et al. 2005; Yoon et al. 2006) have measured the growth of lactic acid bacteria on conventional organic matrices such as beet, onion, carrot and cabbage. From these studies, the maximum concentrations reached by various species of Lactobacillus varied in the range of 9–10 log CFU mL−1. These concentrations were reached after 24 h in carrot juice (Bergqvist et al. 2005), 48 h in cabbage juice (Yoon et al. 2006) and after 72 h in a vegetable mixture (Gardner et al. 2001). It is worth mentioning that in the above studies, Lactobacillus initial concentration was always higher than in the present study. The autochthonous microbial population of raw vegetables and fruits fluctuates between 5 and 7 log CFU g−1, of which lactic acid bacteria represent a minor part (2–4 log CFU g−1) (Di Cagno et al. 2013). In the present study, with the sole lyophilised A. platensis F&M-C256 biomass suspended in water and without inoculum, bacterial concentrations of 2.3 and 6.9 log CFU g−1 were detected at the start and at the end (72 h) of the fermentation, respectively. This indicates that the indigenous microbiota of A. platensis F&M-C256 biomass did not significantly affect bacterial number enumeration and the values found by plate count in the inoculated broth were essentially due to LAB 8014. In accordance with the results obtained in the present study, Bhowmik et al. (2009) found that the addition of A. platensis (up to 10 g L−1) to different Lactobacillus cultures promoted growth up to a maximum of 9 log CFU mL−1 after 10 h, starting from a concentration of 2–3 log CFU mL−1. The positive effects of A. platensis on the growth of lactic acid bacteria can be attributed to the highly accessible and nutritious substances it contains, which stimulate bacterial metabolism (Beheshtipour et al. 2013). These substances include exopolysaccharides, free amino acids and essential vitamins and minerals (Parada et al. 1998). To observe a positive health effect of probiotic consumption, a minimum level of live microorganisms is required (Vanderhoof and Young 1998). This level, depending upon the strain used and the desired health effect, is usually between 8 and 10 log CFU per day for 1 to 2 weeks (Vanderhoof and Young 1998). Nobaek et al. (2000) found that patients with irritable bowel syndrome (IBS) had an imbalance in their normal colonic flora and exhibited a continuous improvement in overall gastrointestinal function during 12 months following assumption of 400 mL per day of a fermented drink containing 7.7 log CFU mL−1 of L. plantarum. Considering the high concentration of LAB 8014 cells (10.6 log CFU mL−1) in the A. platensis F&M-C256 fermented broth, we can conclude that this cyanobacterium is promising for the development of fermented foods rich in probiotics. Lactic acid concentration in the broth during the fermentation process is reported in Fig. 1. Most of lactic acid accumulation (2.93 ± 0.02 g L−1) occurred in the first 24 h of fermentation and the maximum concentration was reached after 48 h (3.67 ± 0.18 g L−1) with a conversion yield of about 40 mg of lactic acid per gram of dry A. platensis biomass. A decrease of pH to values of about 5 was also observed. Considering that L. plantarum has a facultative heterofermentative metabolism, the excretion of acetic acid (not analysed in this study), in addition to lactic acid, might have contributed to pH decrease during fermentation. Common cereal grains have been studied for their ability to support fermentation by lactic acid bacteria. For example, Tanaka et al. (2006) found that the homofermentative L. delbrueckii IFO 3202 was able to produce 28 g L−1 lactic acid from 100 g L−1 of rice bran when coupled with enzymatic hydrolysis. Although a similar concentration of substrate (92 g L−1 of A. platensis F&M-C256 biomass) was used in the present study, a maximum lactic acid concentration of less than 4 g L−1 was obtained. The greater yield of lactic acid with rice bran may be explained by the quick release of sugars following enzyme addition, but also by the higher carbohydrate content and different carbohydrate profile of rice bran (11.3% cellulose + hemicellulose and 46.7% starch + dextrin), probably more suitable to sustain Lactobacillus lactic acid fermentation, compared to A. platensis F&M-C256 biomass (13.4% total carbohydrates). Uchida and Miyoshi (2013) reported a lactic acid production in the range of 1.5–5.4 g L−1 from microalgae such as Chlorella, Tetraselmis and Nannochloropsis. Hwang et al. (2012) investigated the lactic acid fermentation of an Ulva (Enteromorpha) prolifera hydrolysate using different Lactobacillus strains. Similar to the present study, the lactic acid produced over 24 h of incubation by L. rhamnosus was 4.3 g L−1, and a similar production (around 4 g L−1) was observed also for L. salivarius. Fermentation of Irish brown seaweeds (Gupta et al. 2011, 2012) led to a lactic acid production comparable to that found in the present study with A. platensis F&M-C256 biomass. It is to note that A. platensis, like some micro- and macroalgae, favours more growth of lactic acid bacteria than lactic acid production. When the potential application of new matrices for the production of foods is proposed, the digestibility is a parameter which needs to be considered. A two-step (first with pepsin then with pancreatin) digestion protocol was used in this study to assess the in vitro digestibility of the unfermented and fermented (72 h) A. platensis F&M-C256 biomass. Fermentation did not improve digestibility significantly (P > 0.05), however there was an increase of 4.4% (Table 1). Arthrospira platensis cell wall structure is typical of Gram-negative bacteria with a thin peptidoglycan layer (Tomaselli 1997). The easily breakable cell of A. platensis favours the access of the digestive enzymes to the intracellular content, and for this reason, chemical or physical processing steps are in general not required to improve spirulina biomass digestibility (Becker 2007, 2013). Mišurcovà et al. (2010) evaluated the in vitro digestibility of A. platensis and Spirulina Pacifica® produced by Cyanotech Corp. (USA), finding a higher digestibility value both for A. platensis (94.3%) and Spirulina Pacifica® (85.6%) compared to that obtained in the present study for A. platensis F&M-C256 biomass (about 75%). It is, however, worth pointing out that at the end of the fermentation, a large fraction of the solid residue in the broth was composed of bacterial cells, which have low digestibility (Alfano et al. 2015). Arthrospira has in vitro and in vivo antioxidant, radical scavenging and anti-inflammatory activities, principally due to the presence of phycocyanin and polyphenols (Bhat and Madyastha 2000; Abd El-Baki et al. 2009; Liu et al. 2016). The DPPH radical scavenging capacity of fermented (72 h) and unfermented (0 h) A. platensis F&M-C256 broths is shown in Table 1. 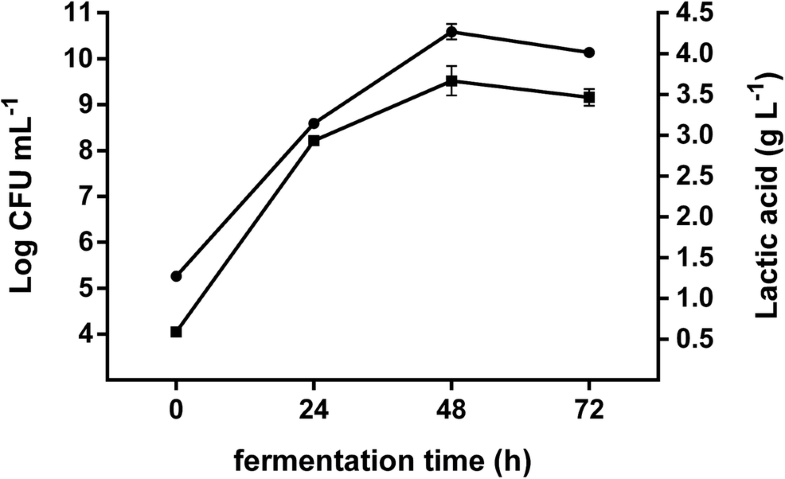 Fermentation brought to an increase of about 80% in DPPH inhibition. Similar to the results obtained in the present study, Liu et al. (2011) reported an increase of DPPH radical scavenging capacity after fermentation of A. platensis biomass in milk. Phenolic compounds are considered major contributors to antioxidant capacity (Abd El-Baki et al. 2009). Total phenolic content of Arthrospira spp. varies from 4.5 to about 50 mg GAE g−1 depending on strain and culture conditions (Abd El-Baki et al. 2009; Liu et al. 2011; Kepekçi and Saygideger 2012). Liu et al. (2011) found that milk with added A. platensis biomass reached 33.6 mg GAE g−1 after 48 h of fermentation and hypothesised that lactic acid fermentation helps the release of polyphenols from spirulina. 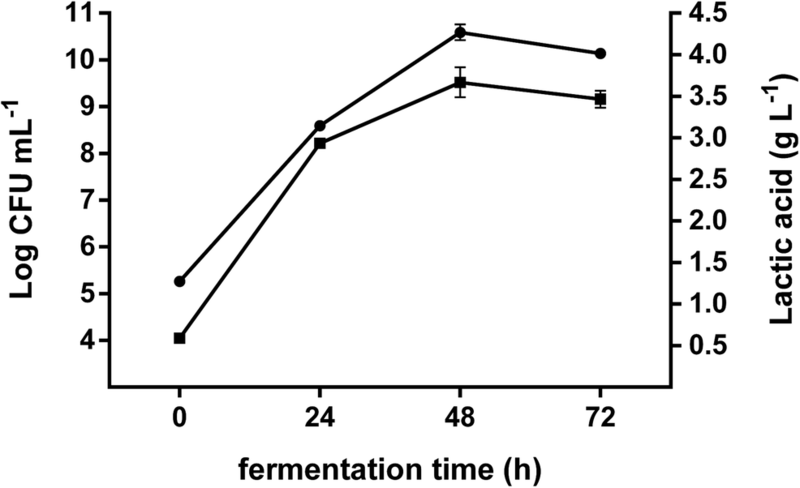 In the present study, the total phenolic content of the fermentation broth increased from 4.5 at the start to 18.9 mg GAE g−1 after 2 days of fermentation and then decreased to 10.9 mg GAE g−1 after 72 h (Fig. 2). The presence of phenolics could be one of the main reasons for the antioxidant activity of the fermented A. platensis broth, possibly together with phycocyanin (not addressed in this study). Further studies are necessary to fully clear this point. Many studies report that L. plantarum strains present antioxidant activity (Li et al. 2012; Kachouri et al. 2015). Suzuki et al. (2013) identified two compounds, L-3-(4-hydroxyphenyl) lactic acid and L-indole-3-lactic acid, as possible cause of DPPH radical scavenging capacity of L. plantarum cultures. It is worth noting that in this work, the broth after 72-h fermentation contained a high concentration of LAB 8014 that could be responsible, together with phenolics and phycocyanin released from A. platensis F&M-C256, for the increase in radical scavenging capacity. In conclusion, this study shows that A. platensis F&M-C256 is a suitable substrate for L. plantarum ATCC 8014 growth. At the end of the fermentation, L. plantarum ATCC 8014 cells constitute more than 20% of the broth dry weight. While no significant enhancement in digestibility of A. platensis biomass was observed following lactic acid fermentation, antioxidant activity was strongly increased (by about 80%). 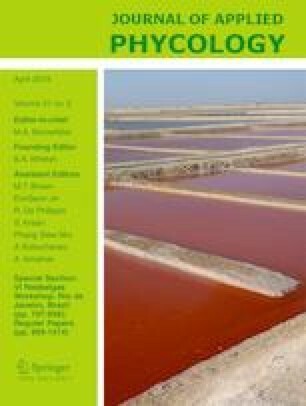 Fermentation by lactic acid bacteria is an appropriate technology to obtain innovative functional products from A. platensis, which can provide to the consumer, besides the highly nutritional properties of spirulina further increased by fermentation, a significant amount of probiotic Lactobacillus cells, thus conferring additional favourable properties to the final product. A stay at the Dublin Institute of Technology was funded by the University of Florence Ph.D programme. The authors are indebted to Archimede Ricerche S.r.l (Imperia, Italy) for kindly providing the A. platensis biomass. A. platensis F&M-C256 belongs to the Microalgae Culture Collection of Fotosintetica & Microbiologica S.r.l., in which company M.R. Tredici and L. Rodolfi have a financial interest. All the other authors have no conflicts of interest.